7-9. 7-9. 7-9. 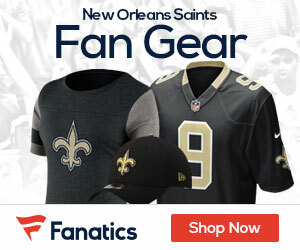 If you're a fan of the New Orleans Saints, then you already know what those numbers are and what they represent. But, as it turns out, you're not alone. That's because inside the Saints Training Facility at 5800 Airline Drive in Metairie (suburban New Orleans), the Saints themselves know what those numbers represent, as well. And as the team is currently beginning the start of preparations for the upcoming 2017 NFL season with this week's opening round of OTA's, the expectations -- or perhaps the word "pressure" is more appropriate in this case -- to change those numbers around is at an all-time high. We're not simply talking about the word "pressure" in the symbolic sense, mind you. But rather, the type of pressure that often finds one without gainful employment and a source of financial income, if the desired results of those expectations aren't met. Splits a family in two -- puts people on streets. Now if you ask General Manager Mickey Loomis, head coach Sean Payton, or any members of the team's coaching staff such as defensive coordinator Dennis Allen if there's any additional "pressure" to win more games and make it into the NFL Playoffs this coming season; they're likely to give a stock answer about how there's always pressure to produce results at the professional level. But this coming season is different. And if somehow they were hoping to ignore the current "win or else" or "do or die" narrative that is being written about them from members of the media (myself included) at the moment, it's not going to go away anytime soon. Mainly because the 7-9, 7-9, and 7-9 finishes of the past 3 consecutive years won't let them, even if they want it to. In the National Football League, winning games and making the NFL Playoffs every year is the primary goal of every single team --- all 32 of them --- to achieve in a given year. ANYTHING less than that, is unacceptable. Although it's more than fair to say that the Saints have been the victim of 'bad breaks' in the past few seasons, especially with particular regard to injuries; it's pretty unlikely they're going to be given a "pass" from that reaching that goal, either. The only question that's left now is just how far of a proverbial rope that team owner Tom Benson -- who turns age 90 this year in only 6 more weeks from now -- is going to give his team management and coaching staff before they figuratively hang themselves. In the Saints "Tom Benson Ownership Era" dating back to May of 1985 when he assumed ownership of the team from original team owner John Mecom Jr., Benson has only had to change general manager / head coaching regimes 4 times (1986, 1997, 2000, and 2006) in the past 32 years; which by NFL standards is pretty damn good. In January of 1986, Benson — who as the new owner first had to suffer through the final (5-11) 1985 season of the left-over Bum Phillips Era that included Phillips' resignation following a Week#12 road win against the Vikings — made the first regime change of his tenure as team owner by hiring long-time NFL and former Bears and Vikings GM Jim Finks as his general manager to replace the departed Phillips. Finks then hired the “hottest” name on the coaching market at that time — 2-time USFL Champion Philadelphia / Baltimore Stars head coach Jim Mora, who was available because the USFL had just went out of business — to be the new Saints head coach. The next year (1987), the Saints had their first ever winning season and Playoff appearance; a precursor to the most successful period in franchise history (a total of 4 Playoff appearances and a Division Championship within a decade) until a “burned-out” Mora’s resignation in the middle of the 1996 season. The 2nd regime change under Benson occurred in 1997, when Benson hired former Super Bowl winning head coach Mike Ditka to be both the team's head coach AND general manager. But unfortunately for Benson, it turned out to be the worst decision of his tenure as Saints owner. In his dual role, Ditka tossed the Saints team right into the NFL’s ‘bottom barrel’ --- after trying (unsuccessfully) to recreate the “magic” that he had as a former Super Bowl winning head coach with the Chicago Bears in the mid 1980’s; which featured a series of horrendous bad personnel decisions that also included the trading of the team’s entire collection of 1999 NFL Draft picks to the Washington Redskins for RB Ricky Williams. Unfortunately for both Ditka and Saints fans, that “magic” was long gone. In early January of 2000 after a horrendous 3-13 season that saw Ditka yelling at reporters by season's end, Benson was forced to listen to the outcry of demands of Saints fans who were openly and loudly calling for the proverbial head of Ditka on a silver platter — although he didn’t have much choice, or else there would have been a lynch mob that would have gone down to the team headquarters on Airline Drive and physically removed Ditka in person, themselves. Benson responded with the 3rd regime change of his ownership tenure in February of 2000 by hiring former Seattle Seahawks executive Randy Mueller to be his new general manager. Mueller then hired the team's former defensive coordinator Jim Haslett to become the new head coach, and together the new Saints front office regime in that year attacked both NFL Free Agency and the 2000 NFL Draft with a sense of urgency — resulting in a “worst to first” turnaround for New Orleans from 3-13 the year before, to a 10-6 record and a division championship, along with the team’s first ever Playoff victory after 33 years of existence. As a direct result of their success, Haslett was even named the 2000 NFL Coach of the Year by the Associated Press for leading the team to its very impressive turnaround. Additionally, Mueller was named NFL Executive of the Year by the Sporting News. However, the relationship between Benson and Mueller soured, and Benson named Mickey Loomis the team's new General Manager in time for the 2002 season. However, the team was never able to get back to the NFL Playoffs under Haslett as head coach after that Division Championship and Playoff appearance in 2000; going 45-51 overall in the 5 seasons afterwards and failing to make the playoffs again before the bottom completely fell out --- made even worse when the team was displaced by Hurricane Katrina and forced to play their "home" games at the Alamo Dome in San Antonio, Texas and at LSU Tiger Stadium in Baton Rouge. Benson waited until the end of the Saints' subsequent 3-13 finish to the nomadic 2005 season, before firing Haslett and ultimately flirting with the idea of moving the team permanently to San Antonio, before returning home to New Orleans for the rebuilding process of both the team and its city that it represented. Ultimately, that led to the 4th (although perhaps not the final one, at least up to this point) regime change of Benson's ownership tenure, when he decided to retain Loomis as General Manager for the 2006 season. After receiving the reassurance of his status along with the new vote of confidence from Benson, Loomis went out and hired the brash young offensive coordinator from the Dallas Cowboys named Sean Payton to be the new head coach for the Saints in January of 2006, and as they say: "the rest is history". Payton then recruited free agent QB Drew Brees of the San Diego Chargers to be the team's brand new starting quarterback; and 11 years, 100 wins, 5 playoff appearances, and a World Championship (Super Bowl XLIV after the 2009 season) later, he we are. However, the only numbers that both Saints fans and the Saints themselves are having to be reminded of is 7-9, 7-9, and 7-9. 7-9 is first and foremost on the mind of Loomis, who now in his 15th year as GM, has had to hear time and time again that the team's performance or its lack thereof, falls squarely on his shoulders. 7-9 is also on the mind of Payton, who in his 10th (technically 11th) season as head coach, has heard the talk of how another disappointing season in 2017 would be the ultimate catalyst to see him coaching elsewhere other than in New Orleans, in 2018 and beyond. 7-9 is certainly on the mind of Brees, since he's in the final year of his current contract and even though he says that's he's "committed" to remaining in New Orleans to finish his brilliant NFL career, is cognizant of the fact that he isn't getting any younger (he turns 39 in January) and wants to win another Super Bowl before he retires --- leaving the door open to the unthinkable (winning a Super Bowl with another team other than the Saints) if need be. 7-9 is on the mind of defensive coordinator Dennis Allen, who has been given a mandate to "fix the defense or else". And last but not least, 7-9 is unquestionably on the mind of Benson; who obviously knows that the sands in the hourglass on what has been a remarkable almost-90 year love affair with the city of his birth, are quickly beginning to run out of time for good. 7-9 is the number of the past 3 years that has ultimately led to the mounting "pressure" within the Saints organization, that everyone of them is starting to feel --- whether they choose to admit it or not. Honestly, is there any other way that they couldn't have? The "pressure" on the New Orleans Saints to have a winning season in 2017 is at an all-time high. Success is the only solution. And however the upcoming season ends up, will eventually determine who can handle the "pressure", and those who can not.